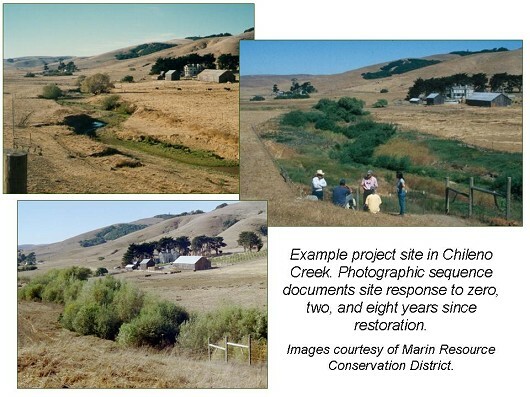 Riparian restoration has had a long history on California's North Coast. 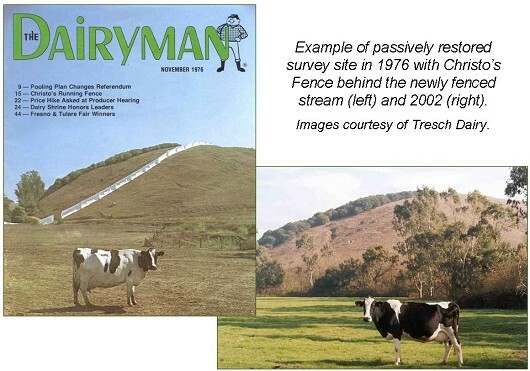 Revegetation has been a common tool since the 1970's for the purpose of rehabilitating degraded streams; however, few studies have quantified site recovery following restoration. We began surveying riparian revegetation project sites in 2002 and finished in 2005 with 102 sites characterized for vegetation and aquatic habitat metrics. We were interested in documenting how specific parameters changed over time (trajectory) so we surveyed sites that ranged from 4 to 39 years since restoration. Our results indicate both direct and indirect intended outcomes have occurred at project sites as well as unintended outcomes that may require an adaptive management process. The effect of revegetation method was of great practical importance so we analyzed specific tree species abundance given planting and bioengineering combinations compared to passively restored sites and non-restored sites. 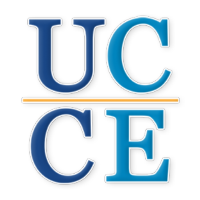 We thank the California Coastal Conservancy, National Oceanographic and Atmospheric Administration's Restoration Center, and University of California Division of Agriculture and Natural Resources for the funding to initiate and maintain this project. We would also like to thank the supportive and cooperative group of natural resource managers in the area who were forthcoming with potential project sites to evaluate. Their willingness and contributions are truly the reason the project is possible. Specifically, we want to recognize the patience and assistance provided by Thomas Schott, Liza Prunuske, Paul Sheffer, Gale Ranch, Paul Martin, Nancy Scolari, Lisa Bush, Leah Mahan, Tresch Dairy, Jeff Opperman, David Stokes, Michael Hansen, Jim Nosera, and Robert Katz. We also need to thank the following organizations that made time to identify project sites and provide specific background information. Forest, Soil & Water, Inc.